Three Oranges Journal. About the Prokofiev family. 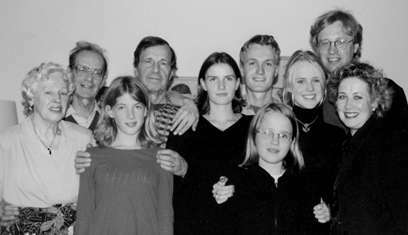 The extended family: in 1997 the Prokofievs met up in Paris to celebrate the centenary of Lina’s birth. From left to right: Nadejda and Sviatoslav Prokofiev, Beatrice, Oleg, Cordelia, Gabriel, Nika, Lina, Serge ProkofievJr. and Irina Prokofiev. In this regular column, members of the Prokofiev family will be invited to share their memories, knowledge and opinions. Prokofiev left many descendants, and since hopefully many of them will contribute to this journal over the years, it might be of interest to the readership to familiarise themselves with their whereabouts. In 1923 Sergei Prokofiev married Carolina Codina who gave him two sons: Sviatoslav and Oleg. Sviatoslav and his wife, Nadezhda, lived most of their life in Moscow but have now moved to Paris close to their only son, Sergei. Sergei (referred to in this journal as Serge Prokofiev Jr.) is married to Irina, with two daughters. Oleg was first married to Sofia Korovina with whom he had a son, Sergei, who now lives in Germany with his wife Astrid. From his second wife, Camilla Gray who died at a tragically early age, Oleg had a daughter, Anastasia. Some time after his move to Britain, Oleg married Frances who gave him five children, one of whom, Quentin, died at an early age. Frances Prokofiev, her four children and Anastasia live in Britain.